Pierluigi’s is Beckenham’s premier dining venue. Under the personal management of Pierluigi, this bright, attractive, light and airy restaurant reflects all the charm you can expect from a genuine Italian environment. Relax in the pleasant bar area whilst you browse the menu. All dishes use fresh ingredients and the menu has a wide selection of vegetarian dishes and daily fresh fish. A five minute walk from extensive public car parks. Open 7 days a week 12-3pm and 6-11pm. All major credit cards accepted. 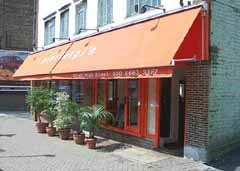 Authentic Italian cuisine, the menu has a range of pastas, risottos and house specialities.